Jean-Baptiste-Pierre-Antoine de Monet, chevalier de Lamarck, more commonly known as Jean-Baptiste Lamarck, was a legendary French biologist who advocated that acquired characteristics are inheritable (known as Lamarckism). Though his theory of heredity has been refuted by modern genetics and evolutionary theory, nevertheless Lamarck is widely regarded as one of the most influential naturalists and an important forerunner of evolution. 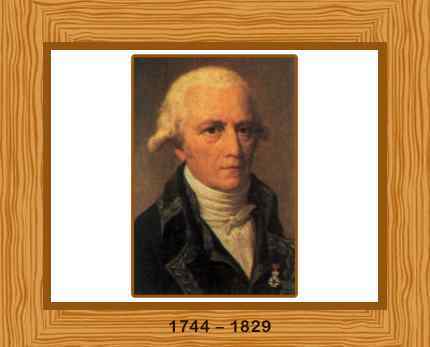 Born in Bazentin, Picardy, France on 1 August in 1744 to an aristocrat father, Jean-Baptiste Lamarck was the youngest of eleven children. He initially followed in his family’s tradition and became a soldier at the age of seventeen but an injury forced him to retire after seven years in 1768. Garrisoned in the south of France, he developed an interest in collecting plants. Lamarck then worked for a bank clerk fora short time and he then began to study medicine and botany. He issued his first work, the three volumes “la Flore Française”, (French Flora) in 1778. The book gained him fame and with his good friend and naturalist Georges Buffon, who was the director of the Jardin du Roi, he was made a member of the Academy of Sciences in 1779. Lamarck was appointed an unpaid associate botanist in 1783. He soon gained worldwide acclaim and began a career in 1788 at the prestigious botanical garden, Jardin du Roi, Paris (now Jardin des Plantes). Between 1783 and 1792 he published three botanical volumes for the Methodical Encyclopedia. As the garden was reorganized in 1793, and Lamarck was made a professor of the “insects, worms, and microscopic animals”, later coining the term invertebrates for these creatures. He also studied seashell fossils and observed that the older the fossils were, the simpler they appeared. Lamarck’s theory of evolution was published in 1802 in “Recherches sur l’organisation des corps vivants” (Research on the organization of living bodies) and in his 1809 book “Philosophie zoologique” (Zoological Philosophy). He proposed that the most basic of plant and animal life were produced by spontaneous generation. He then proposed that two forces caused evolution. Firstly, “the force of life” which caused more complicated organisms to develop. Nature, in producing in succession every species of animal, and beginning with the least perfect or simplest to end her work with the most perfect, has gradually complicated their structure. Lamarck also suggested that a force adapting animals to their local environments had an effect on development. He hypothesized that an organism can pass on characteristics that it has acquired during its lifetime to its offspring. He explained that this force caused the features of giraffes, elephants, storks, swans, and other living beings as a result of their long-maintained habits. Lamarck married Marie Anne Rosalie Delaporte in 1778 and they had six children before she died in 1792. He married Charlotte Reverdy in 1793 and a year after he death in 1797, he married Julie Mallet. Lamarck went blind and died a poor man in Paris on December 18, 1829.